The Keweenaw Climate Community (KCC) is a grass-roots, bipartisan organization in the Keweenaw coming together to fight the global issue of climate change. The policy group within KCC coordinates local policy efforts that you can get involved in, while the education group is organizing educational events in local schools. We help you meet with your elected officials, contact them with your concerns, organize local policy events, and make a difference. Join us! All are welcome. December 12, 2017 Event! Do you want to learn how to communicate climate science and the need for climate action? 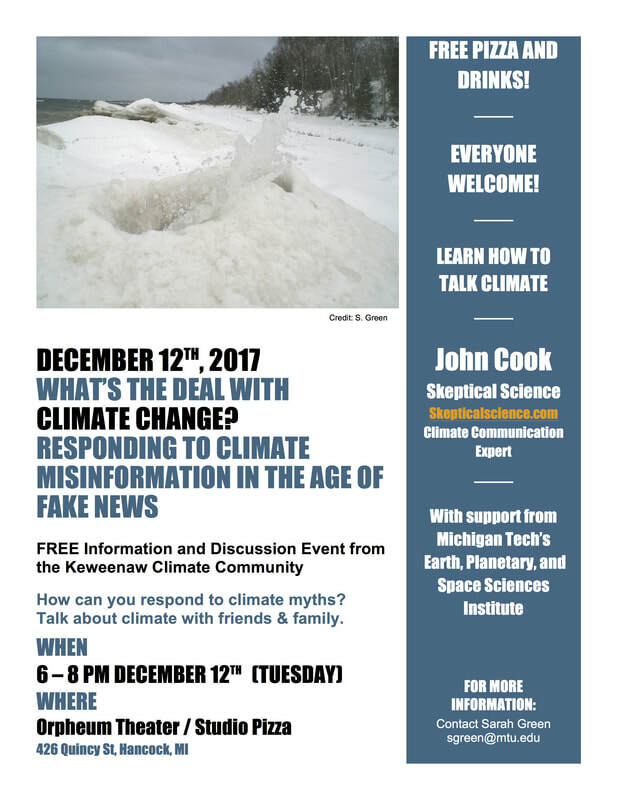 Come to an excellent workshop led by John Cook of Skeptical Science next Tuesday Dec. 12th. Hosted by the Keweenaw Climate Community at The Orpheum Theater/Studio Pizza in Hancock, you can expect great pizza and great conversations! Want to learn more? Rob Handler gave a great presentation to the MSU Extension Team about KCC's work. You can download it to learn more. We exist to give citizens like you the tools to influence your elected officials, take local action, and create a more resilient future for our community. Many members of this policy group may also wish to coordinate with the Citizens’ Climate Lobby to advocate for revenue-neutral carbon tax proposals such as the Climate Leadership Council plan. We have recently launched a Houghton/Hancock chapter of the Citizen's Climate Lobby. We hold our monthly meetings in the Portage Lake District Library. You can check our facebook page at https://www.facebook.com/cclhoughtonmi to learn the times each month. To join this local chapter, click here and then select the MI Houghton chapter in the dropdown box. We will organize letter-writing campaigns and lobbying events to persuade our representatives to support a Carbon Fee and Dividend plan. Above all, we will work to foster bipartisan support for a fee and dividend plan--creating the political will necessary for Congress to act. Visit KeweenawNow for news, views, and life on the Keweenaw!